For cooling systems up to 20 litres capacity, permanently seal head gasket, block, radiator and water pump leaks. If adding to the radiator do not pour directly onto the radiator core. 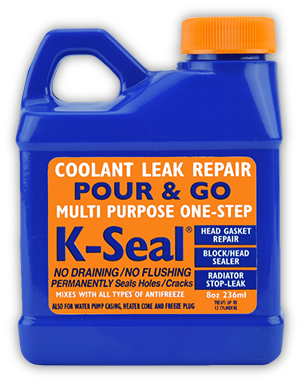 K-Seal products are compatible with all types of antifreeze/coolant and are not affected by other additives that may already be in the cooling system. It does not matter if you add K-Seal products to a cold or hot engine, but take care when working with a hot engine. For very small cooling systems (e.g. motorbikes), it is possible to add just part of the bottle but you must make sure that the contents are extremely well mixed first. engine idling until the temperature gauge reaches the normal level. After K-Seal has made a repair it is not necessary to leave it in the system because the repair is permanent. You can either choose to replace the contents of the cooling system or leave the original K-Seal product in the system.